I'm still buzzing from the news that Gillie turned up at White Hart Lane today to watch the 3-1 win over West Ham. I will confess, though, that it's a bittersweet moment. I had so wanted to be there and while I had heard a number of rumours about his imminent return there had been nothing concrete. I had my own long-standing arrangement: a return to the amateur club were I played for many years for a 40th anniversary dinner. I met several people who had read all about Gillie and I spent quite a long time talking about him (I'd also had to pull together an itinerary ahead of today's game for Arild Stavrum, the former Aberdeen striker who is writing a book about fathers and sons and football) so there was a kind of prescience about his reappearance at the Lane today - even if I wasn't quite aware of what that nagging feeling was at the back of my head - I simply thought it was a case of one too many last night. Gillie's return marks the end of a series of aims that I had hoped would come to fruition when I set about trying to track him down. The first was securing his entry into the Scottish football hall of fame - that happened even before the book appeared; the second was Dundee giving him some long-overdue official recognition - that box appears to have been ticked too since the club is planning to name a lounge after him the coming months; the final hope was that he would go back to the Lane. I can't wait to see Match of the Day 2 tonight for a glimpse. Just a quick reminder that I'll be doing a reading at the Glasgow Spurs Supporters' Club at the Rhoderick Dhu pub in Waterloo Street, Glasgow on Thursday night (November 22nd) after the Lazio-Spurs game. We'll watch a couple of short films - one about Gillie's time at Spurs including interviews from Dave Mackay and assorted former team-mates and the other - based around an interview I gave for STV's excellent Scotland's Greatest Team programme that aired in March 2010 - which includes footage of his time at Dundee, Tottenham and with Scotland. After that, I'll do a reading featuring special guests Alan Mullery, Phil Beal and Cliff Jones* and then we'll take questions from the floor. It doesn't matter if you're not a Spurs supporter - if you're a fan of Gillie, we'd be delighted to see/convert you. *Actor's voices may be used to protect the innocent. See you on Thursday . . . hopefully. There’s been something incredibly dull about Tottenham’s Europa League campaign thus far despite AVB’s proclamations that the competition is close to his heart and that he would be treating it and the ‘dimensions’ it provides with the utmost gravity. Next up for Spurs is the home tie against Maribor before an away trip to Rome to face Lazio in a match that could decide who wins the group - provided Spurs haven’t put on their draw-from-the-jaws-of-victory routine against the Czechs a fortnight earlier. 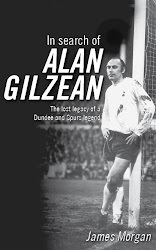 It’s the Lazio match on Novermber 22 I’m particularly interested in, though, because right after that game I’ll be doing my first ever book reading of In Search of Alan Gilzean at the Rhoderick Dhu (Waterloo Street, Glasgow - just across from Central Station) courtesy of the Glasgow Spurs Supporters Club. So, if you’re even remotely excited by the thought of hearing about a time when Spurs swept all before them on the way to winning the 1972 version of the Europa League (trading as the UEFA Cup) or want to know why Gillie hated Arsenal and especially loathed Bob Wilson then please come along and I’ll do my best to fill you in. There’ll be a short film, I’ll do some reading and then we’ll have a Q&A. There might even be time for a beer, a glass of wine or Gillie’s special favourite a Bacardi and Coke. I’ll bring more details in the coming days. Fellow Spurs fans . . . I have been asked to compile an itinerary for Arild Stavrum, the former Aberdeen and Norway striker, who is writing a book about fathers and sons in football. Arild is attending the Tottenham-West Ham game on Sunday, November 25 and wants a few must-do suggestions for his time in north London. My own routine usually involves taking the train up from Liverpool Street to White Hart Lane, followed by a few beers and a sing-song in The Bricklayers. After the game, it’s either back to the Brickies or a Chick King and then the long-walk down the High Road to Seven Sisters. It’s fairly mundane stuff usually because it’s governed by the tight turnaround that comes with the territory of long-distance travelling to games so what I’m looking for are tips for specific Spurs-friendly greasy spoon cafes, pubs I might have missed, local sights and characters that must be seen/met. Given its history, the Bell and Hare is surely a must and I think a trip to Bruce Grove Museum to see the Spurs archives is worthwhile. Is the stadium tour worth a trip? It’s 25 years since I did it last. He’s also looking for some historical context to the fixture and what it means to Spurs fans and why it is of significance (perhaps more so for the other lot than us but maybe you disagree). Anyway, I’d be grateful if you could let me know your own experiences and I’ll pass on the best of them to Arild. For the record, he is one of us. He’s also a thoroughly decent chap to boot. (Although I can’t vouch for what might happen should Brad Friedel chuck his shirt at him in the Park Lane end after our 5-0 defeat of the Hammers in three weeks’ time). But then you knew that already.